Below is a history of the first year of our Church as recorded in the minutes of the business meetings. It is in honor of the men and women that had a vision and desire to establish a local congregation and place to attend to worship and serve God. God has richly blessed us through the years because of their dedication and service. Preacher Doug Tate made a proposal to all adults present to contact Mr. Avery Land and make arrangements to purchase from him the property at the foot of Fredonia Mountain for a church. Eight adults were present and all 8 voted to buy the property. The announcement had been made concerning the property for the three services prior. The Way of the Cross Baptist Church was organized at 2:30 pm with Reverend Joe Miller moderator, Cassidy Neighbors, deacon from South Daisy Baptist Church, Daisy, TN seconding the motion. Bro Miller opened the meeting in prayer. The By-Laws was given by the moderator, Bro Miller. There was no discussion on the By-Laws. Wayne H. Wagner, by letter from First Baptist Church, Dunlap, TN. Susie Wagner, by letter from First Baptist Church, Dunlap, TN. Lana Price, by letter from Flat Mt. Baptist Church, Dunlap, TN. Lola Mae Boston, by statement. Ben Dean, by letter from Flat Mt. Baptist Church, Dunlap, TN. Cleo Dean, by letter from Flat Mt. Baptist Church, Dunlap, TN. Karen Dean, by letter from Flat Mt. Baptist Church, Dunlap, TN. Bennie Dean, by letter from Flat Mt. Baptist Church, Dunlap, TN. Doug Tate, by letter from New Salem Baptist Church. Della Tate, by letter from New Salem Baptist Church. Jeff Tate, by letter from New Salem Baptist Church. Ella Price, by letter from Flat Mt. Baptist Church, Dunlap, TN. Bob Hickey, by letter from Flat Mt. Baptist Church, Dunlap, TN. Testimonies were given by each member. A motion was made to call Rev. Doug Tate as Pastor of Church. The motion was seconded and the vote was 100%. A motion and second was made to adjourn. The Pastor, Rev. Doug Tate, called a meeting into order to elect a Church Clerk. A motion was made and second to elect Susie Wagner as Church Clerk. It was also discussed to have the first business meeting the second Wednesday night as the Church was in revival the first week of the month. This motion was carried and the meeting adjourned. Tommy Price joined the Church by letter from Flat Mt. Baptist Church. 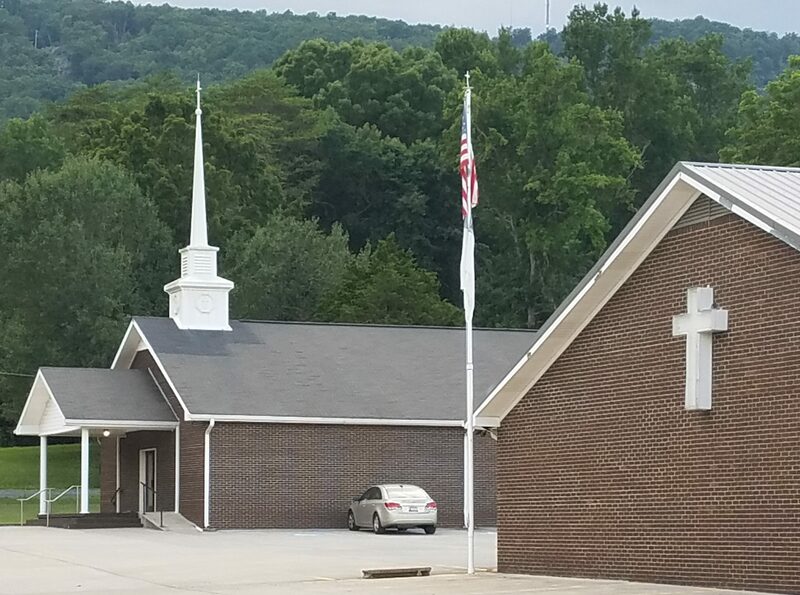 Pastor Doug Tate called a meeting of all the members to meet at the Church to make plans for buying the property at foot of the mountain, which had been voted on. Also they were to plan the building of the Way of the Cross Baptist Church and how it was to be paid for. They voted to pay $1000 out of Church treasury and borrow $1500 from the bank to pay the balance to Mr. Avery Land. The deed had been made and plans were underway to place a sign on property that would state the building soon to be underway would be the Way of the Cross Baptist Church. Motion made to buy a church starry and to erect a sign on Church property stating the building soon of Way of the Cross Baptist Church. Also a request was made for someone to build a miniature church house to be placed in Church for the Building Fund. Bro Tate asked the adults to meet each Thursday night for visitation. The children were to meet for choir practice with Lola Mae Boston and Della Tate. No further business. A motion was made and second to adjourn. The regular monthly Church business meeting was held with Bro Doug Tate as moderator. The treasury report was read and approved. There was no old business and no unfinished business. The miniature church was built and placed in the Church for the building fund. As money is collected for the Church building, it is placed in savings account to draw interest until it is needed. Bro Ben Dean had called the McMinnville Block Company about blocks for Church building. They would deliver blocks for 24¢ each. The men will meet in near future on getting bids for building of Church. The Church voted to set price of blocks at 20¢ each or 5 blocks for $1.00. The men had met and brought before the Church to pay the Pastor $30/week salary. Motion made a second. Motion made to buy tracts for Church. Bro Ben Dean was to order these. With no further business, a motion and second was made to adjourn. The regular monthly Church business meeting was held with Bro Doug Tate as moderator. Treasury report was read and approved. There was no old business. Bro Tate recommended to Church to take $10 from his salary each week to pay two missionaries $15 each per month (Bro Derushia, Bro Hampton) beginning 1st of February. Motion made and carried. Bro Tate also asked the Church to meet on each Saturday afternoon for visitation, instead of Thursday nights. Bro Dennis Boston made a motion to meet and draw up some plans for Church building and start building it, to borrow enough to put up building and pay what is being paid on rent and payment of land loan on it. No further business, so motion made to adjourn. The monthly business meeting was called to order by Bro Doug Tate, moderator. Treasurer’s report was read by Bro Ben Dean. Motion was made by Bro Dennis Boston that it be approved and second by Bro Wayne Wagner. There was no old business. Bro Tate had met with Mr. Shrum (a contractor) about the new building. The plans and cost would be drawn up and brought before the church. Bro Tate asked the Church to set the first Sunday in each month as special Building Fund Day. No further business, a motion to adjourn was made by Bro Dennis Boston, second by Bro Tommy Price. The monthly business meeting was held with Bro Tate as moderator. Treasurer’s report was read by Bro Ben Dean with motion to accept it by him and second by Bro Dennis Boston. Bro Tate said Mr. Shrum, the contractor from Chattanooga, was ready to lay transit for foundation of Church building when ground was all bulldozed off. Building material priced in Chattanooga and Wayne Reynolds will price and which is cheapest. The price of building Church is $6250. American National Bank agreed to let Church have $5000 loan if land loan is paid off. Motion was made by Bro Dennis Boston to take $1000 out of building fund and balance of loan out of Church treasury and pay off loan on lot. Build as far as $5000 would go and then borrow some more. Second by Bro Wayne Wagner. No further business, a motion to adjourn was made by Bro Ben Dean and second by Bro Dennis Boston. The monthly business meeting was held with Bro Doug Tate as moderator. The Church treasurer’s report was read and approved by members of the Church. Bro Tate said our radio broadcast would be $25 each Sunday and would be paid for by love offerings. The contractor was notified to go ahead with building. There were 25 bumper stickers ordered by Bro Tate to be used on each member’s car. There was discussion on builder’s insurance. A motion was made to get some builder’s insurance to start building. Motion made to elect a Building Committee of Bro Ben Dean, Bro Dennis Boston, and Bro Wayne Wagner. Motion made to adjourn by Bro Tommy Price, second by Bro Wayne Wagner. The monthly business meeting was held with Bro Doug Tate as moderator. The Church treasurer’s report was read by Bro Ben Dean. Motion to accept report was made by Bro Wayne Wagner and second by Bro Dennis Boston. The first payment was made on the building loan. Bro Doug Tate send for a tax number for the Church. Progress is made on Church. Blocks will be finished tomorrow. Bro Shrum will start on rafters by Friday. No further business, a motion was made by Bro Dennis Boston to adjourn, second by Bro Wayne Wagner. The monthly business meeting was held with Bro Doug Tate as moderator. The minutes were read by Sis Susie Wagner. The Church treasurer’s report was read by Bro Ben Dean. Motion to accept reports made by Bro Wayne Wagner, second by Bro Dennis Boston. Bro Tate brought before the Church the need to borrow $2000 more to pay on Church building, and get figures on putting in restrooms and electricians to finish wiring the Church. Bro Ben Dean made a motion for the Church to buy carpet for nursery. Bro Dennis Boston seconded the motion. No further business, motion was made by Bro Dennis Boston to adjourn and second by Bro Bob Hickey. A special-called business meeting was held. The Church voted to get the $2000 loan from Hamilton National Bank in Chattanooga, to be repaid in 24 monthly installments. This money was to be used to finish work on Church. The monthly business meeting was held with Bro Doug Tate as moderator. The minutes were read by Sis Susie Wagner. The Church treasurer’s report was read by Bro Ben Dean. Bro Tommy Price made a motion to accept the reports, seconded by Bro Wayne Wagner. Bro Tate had called three stores to price air conditioners. The low price was $269. Motion to buy the lowest priced unit was made by Bro Dennis Boston and second by Bro Wayne Wagner. Bro Ben Dean was nominated to pick up the air conditioner the next day. Motion was made by Bro Dennis Boston to buy two loose-leaf songbooks, second by Bro Wayne Wagner. Motion was made by Bro Ben Dean to pay Bro Doug Tate’s phone bills made where Bro Shrum was working on Church building, second by Bro Tommy Price. Motion by Bro Dennis Boston to get Revival posters. Bro Clay Wilson donated a Cross to the Church. This is to be picked up. No further business, motion to adjourn by Bro Dennis Boston, second by Bro Tommy Price. 11 decisions were made during revival, August, 1971. The monthly business meeting was held with Bro Doug Tate as moderator. The minutes were read by Sis Susie Wagner. The Church treasurer’s report was read by Bro Ben Dean. Motion to accept the reports was made by Bro Tommy Price, second by Bro Wayne Wagner. Bro Tate called for a meeting with the men of the Church at 6 pm, Sunday, September 5. New Church officers to begin October 1. Bro Tate called for a special business meeting 3 weeks from Friday night. No further business, motion made to adjourn by Bro Tommy Price, second by Bro Wayne Wagner. The monthly business meeting was held with Bro Doug Tate as moderator. The minutes were read by Sis Susie Wagner. The Church treasurer’s report was read by Bro Ben Dean. Motion to accept the reports was made by Bro Dennis Boston, second by Bro Wayne Wagner. Men had met to decide on heating of Church. Cost to install a furnace would be $1095. The Church would need to pay $400 down and the balance by February 1, 1972. Motion to buy the system was made by Bro Tommy Price, second by Bro Dennis Boston. The radio broadcast funding was discussed. Bro Ben Dean made a motion for the Church to fund the broadcast for one year, second by Bro Wayne Wagner. Motion made by Bro Ben Dean to adjourn, second by Bro Dennis Boston.